Ann’s years as a Marine taught her gym discipline. After the Corps, she struggled to adapt to a new way of life. See how she persevered and rekindled the fire on stage! I started lifting weights when I was 16-years old to get ready for Marine Corps boot camp. Prior to discovering weightlifting, I had an eating disorder and body image issues, but turning to weights changed all that! I turned 18 at Parris Island and spent 10 years on active duty in the Marine Corps. Through my years in the Corps, I was in excellent shape. I considered competing back then, but didn't quite know how to go about it. I was known for my "guns" and a constant presence in the gym. I got out of the Marine Corps in 2005 to venture out on my own. My entrepreneurial endeavors brought on challenges and obstacles like none I had ever encountered before. I worked around the clock and experienced entirely new levels of stress. It took a toll on my health and I gained weight. I would yo-yo with my weight until I finally started getting back into shape at the end of 2008 - beginning of 2009. I was newly engaged to a bodybuilder for a while and life was going good. Unfortunately, life started getting difficult again and I was plagued by a series of injuries that kept me out of the gym. I was depressed by life, not able train, and was in a relationship that was falling apart. 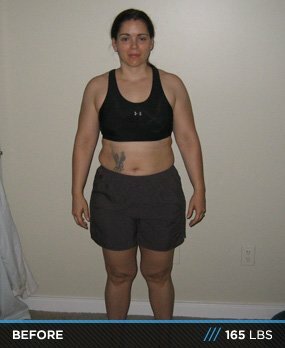 By mid-2010, I was at my heaviest weight ever, tipping the scale at more than 165 pounds. Fortunately, my injuries had been healing and in October of 2010, I committed to getting back into shape. She trains like a beast and makes her presence known. I was no stranger to the gym and training like a beast. I had done it for so many years in the Corps that when my injuries were healed I got back at it hard in the gym. I found a new gym (NOLA Fit) to go to that I'm much happier with and got myself back on track, training 5-6 days per week. I did a mixture of weightlifting, high-intensity interval training and some regular cardio on various cardio machines. I also got on a strict, specific diet and got used to eating pretty much the same foods day in and day out. It became about fueling my body - not taste. Not many days go by that I don't feel hungry at some point during the day. It's just how it is now. My diet has changed over the last 18 months. It got stricter. In June of 2011, while watching the Greater Gulf State Championship, I decided it was time to do what I had been interested in doing for so many years - step on stage and compete! It so happened that right around the time I made the decision to start competing, I was told about the new Women's Physique Division, which I discovered was ideal for me. Once I decided I was going to compete in 2012, my diet got more strict. My coach created my diets and we've experimented with a few variations to include carb-cycling. It's important to test diets out to find out what works and doesn't work for your body type. My first competition was on May 26, 2012 at the Camellia Championship in Slidell, Louisiana where I won and became Louisiana's first Women's Physique division winner! A few weeks later, I did the Greater Gulf States Championships and came in with a softer look which cost me dearly; I came in last place. My goal had been to qualify for nationals, but failed to do so. Thankful, 21 days later, there was an opportunity for me to redeem myself. On July 14, I competed in the Louisiana Championships, won my class, and qualified for Nationals! When I'm determined to do something I get it done. I've lost 50 pounds to get to my goal of finally competing! I take hoodia 30 minutes before three of my meals throughout the day when I need to and depending on the level of carbs in my diet. I sometimes also use thermogenics. I'm very careful to cycle on and off fat burners and thermogenics. Because I've been training since I was 16-years old, I know my body very well. Might sound weird, but my muscles tell me what they need … the ways they need to be hit. I not only know what muscles I will train, but how many sets, reps and how I'll superset; that comes while I'm training and what my body tells me. I said it might sound crazy! I always warm-up with 15 minutes of cardio, and after training I normally do another 15-20 minutes. Now that I'm really trying to lean down, I do morning cardio for about 30 minutes three times per week in the morning. It takes commitment, willpower, motivation, and self-discipline to reach goals and to make real body and life transformations for yourself. It's important to put the right things, expectations, and tools in place to set yourself up for success. It will likely mean making some sacrifices and having the people in your life not only understand, but also support you. The mindset you establish will be what gets you through the tough times when you want to quit, give up, or cheat on your diet. It's also important to realize that this is something that is done one day at a time. Remember, I started back in October of 2010. I didn't rush the process; look for quick fixes, answers, or miracle pills. I put in the hard work day in and day out. Transforming your body is about making changes in your life, and you need to make the right changes in order to maintain the results of your transformation. You also want to do it right so you don't harm yourself, destroy your metabolism, or get injured. Be patient and committed to your plan. Your body will respond and you will see results, I promise you. Our bodies are amazing like that when we start doing all the right things to it.